One of the best ways to ensure that programs and policies support the health and well-being of youth is by including youth in research. Tobacco is a great example; public health researchers studied the impact of adolescent tobacco use on the development of cardiovascular disease in adulthood. That evidence influenced policymakers to launch evidence-based policies and campaigns that have resulted in a decades-long downward trend in cigarette use and improved health. The same pattern has not occurred in other research domains, such as adolescent reproductive health. Despite high rates of unintended pregnancies, particularly among teens, an extremely meager percent of research grant funding from the National Institutes of Health (NIH) has supported contraception research for more than a decade, and an even smaller portion of that funding supports adolescent contraception research specifically. As we just celebrated PolicyLab’s 10th anniversary year, we thought it important to consider how funding for adolescent reproductive research has shifted over the past decade, why this funding shift matters and how to move forward in a way that supports young people. Why does it matter if adolescent contraceptive research is funded? First, even though drugs behave differently in adolescents than adults, most drugs are developed and tested in adults, not adolescents. In fact, few contraceptive medications and devices have been tested in adolescents despite two federal laws requiring that new drugs be tested in target populations, including children. Low funding levels for contraceptives research in adolescents has likely contributed to the lack of research in this area. The second reason adolescent contraceptive research is important is because adolescents stand to gain the most from contraceptive use. 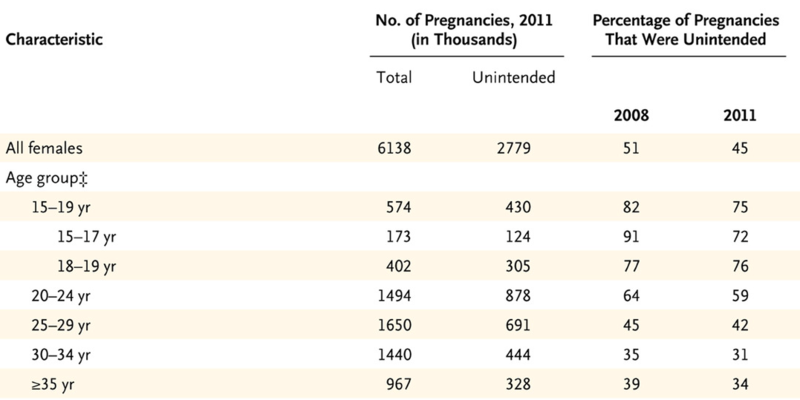 In the U.S., young women have the highest rates of unintended pregnancy, as seen in the chart below. This startling statistic underscores why evidence-based efforts to decrease teen pregnancy rates should be a public priority. We have seen some progress with teen pregnancy rates among women ages 15-19 years having declined by 51 percent since 2007, but these rates remain seven times higher than those in other Western developed countries. Meanwhile, national teen pregnancy prevention efforts are being reoriented away from effective approaches, like improving contraceptive access, towards approaches proven ineffective or inappropriate for adolescents. Adolescent contraceptive research is also important because contraceptive methods are routinely used to manage a wide range of medical problems in adolescents beyond pregnancy prevention. From acne to menstrual cramps, menstrual migraines to life-threatening menstrual bleeding, contraceptives improve the health and quality of life of countless young people. By excluding adolescents from contraceptive research, we have made it harder to identify optimal options for managing this broad array of medical conditions. Finally, as adolescent health care providers and researchers, we couldn’t discuss this issue without pointing out the value of research for ensuring that our workforce is properly trained to care for adolescents using contraception. The best strategies for helping adolescents to use contraception correctly and consistently differ by age and maturity level. Funding for research that seeks to understand how to deliver the best care possible for adolescents is essential for meeting their unique needs. Beyond the impact on adolescents, lack of federal research funding is a detriment to developing a pipeline of researchers committed to improving adolescent reproductive health. When each of us started out, we had mentors as guides who had successful careers doing adolescent contraceptive research. Some of those mentors have moved into other areas due to difficulties getting funding to continue their work. Without federal research support, many research scientists—whether they do lab research or work directly with patients—are unable to secure stable faculty positions. This may drive scientists who are passionate about adolescent health to apply their gifts to other fields. If there are few senior investigators pursuing studies on adolescent contraceptive research, then there is a dearth of mentors to inspire future generations of researchers. Lack of funding also limits innovation. Current contraceptive methods have changed little in the past 50 years. The same options have existed for more than a decade: pills, patches, vaginal rings, shots, subdermal implants and intrauterine devices. Although the range of options sounds broad, the reality is that adolescents just aren’t adhering to the majority of these methods—particularly those used most commonly. No one is advancing the field by examining alternative delivery forms that teens may find more acceptable or adhere to at higher rates. The simple fact is that innovation follows money, and we need to invest in adolescent contraceptive research if we are to see a return on the investment at the population health level. There is evidence of recent positive steps in supporting adolescent contraceptive research. The Gynecologic Health and Disease Branch (GHDB) of the Eunice Kennedy Shriver National Institute of Child Health and Human Development (NICHD) has worked with the Fertility and Infertility branch to craft several Funding Opportunity Announcement. In addition, the NICHD, which is the primary institute that reviews contraceptive research proposals, announced in the fall of 2018 that it is undergoing a strategic planning process and invited suggestions in this specific area. NICHD also recently hired a pediatric gynecologist to develop a clinical and research program dedicated to pediatric and adolescent gynecology, an unprecedented opportunity to bring together those with broad interests in pediatric and adolescent reproductive health. Finally, multiple attempts to roll back the Affordable Care Act (ACA), which includes a mandate for insurers to cover all categories of contraceptive methods, have failed. For the moment, this means adolescent access to contraceptives is preserved. However, research is still needed to understand the impact of the ACA and other federal- and state-level policies on contraceptive access among adolescents. Such information can be used to inform additional policy changes that will ensure the health of our nation’s youth. Cynthia Mollen, MD, MSCE, is examining strategies for linking adolescents seen in the pediatric emergency department with community-level contraceptive services. Emily Gregory, MD, MHS, developed a quality improvement initiative to identify new teen mothers with unmet contraceptive needs and connect them with CHOP contraceptive service providers. I (Aletha) am leading a clinical trial assessing how effective health coaches can be at improving correct and consistent contraceptive use, as well as a study of young women’s experiences with IUDs during the first 12 months of use. With limited funds comes limited opportunities to positively impact the health and well-being of our nation’s youth and young adults. Given the current political climate, this is an important time to strategically consider the adolescent contraceptive research agenda and the value of investing in comprehensive, teen-focused research projects. Prioritizing adolescent contraceptive research will allow us to further understand and meet teens’ unique sexual and reproductive health needs and, ultimately, help them transition into healthy, productive adults. Andrea Bonny, MD, is a principal investigator in the Center for Clinical and Translation Research at the Research Institute at Nationwide Children's Hospital and an Associate Professor of Pediatrics at the Ohio State University. Veronica Gomez-Lobo, MD, is an obstetrician-gynecologist and the director of Pediatric and Adolescent Gynecology at MedStar Washington Hospital Center and Children’s National Health System in Washington, D.C.